Greetings in the Mercury-day ... the day of Balance, 'As Above, So Below' ... The day of Maitreya and the Divine Logic, the Divine Mathematics ... I AM modestly an apprentice. And Lord Maitreya ... is Lord Jesus Twin Brother ... I confess I love him ... as well to Lord Jesus. Lord Maitreya and Lord Jesus ... The Twins sons of Gabriel Archangel. And if I ask you who are the Four Beasts before the Throne of God ... as commented in the Book of Revelations ... few will answer. Lord Maitreya is the Lion before the Throne. Lord Buddha (who is another Consciousness of the Twin), is The Calf before the Throne. Lord Jesus is the Man before the Throne. Lord Sanat Kumara is the Flying eagle before the Throne. Remember they say ... day and night ... Holy, holy, holy, Lord God Almighty, which was, and is, and is to come. Now ... Holy Friends ... It is 'High Physics' which includes 'The Cytology of the Soul' ... no University propose this discipline ... How 'Our Soul' is divided ... in Space/Time when we born ... How a Great Piece of Our Soul .. remains in High Dimensions ... 4D ... The Dimension of Time introduced by Professor Einstein ... the 5D the dimension of Unconditional Love ... etc. The Twins ... Lord Maitreya and Lord Jesus ... were one ... eons ago. Then they divided in two ... the Twins ... One is called Maitreya and one is called 'Jesus' (or Sananda). Now they that was divided ... become One ... but each one keep both ... their Own Consciousness ... Jesus like Jesus, Maitreya like Maitreya ... as well United. 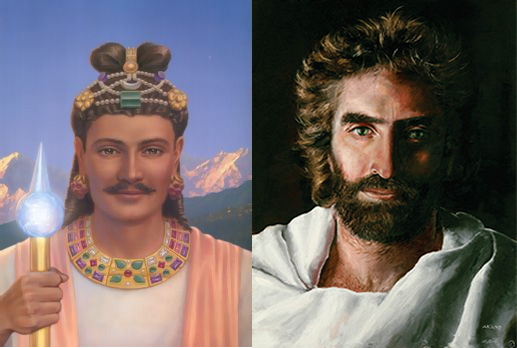 Maitreya recently was called ... 'Maitreya Jesus' ... and Jesus the King ... 'OJesus'. Johann Sebastian Bach ... the Great Baroque Composer ... explains that its Music ... propose the 'Language of Angels'. Heaven is well Organized ... Earth too. Now ... the Main Archangels are 7: Gabri-el, Micha-el, Chamu-el, Rapha-el, Uri-el, Jophi-el, Zadki-el. Their relative Female Partners (Archeia) are: Hope, Faith, Charity, Mary (Mother Mary), Aurora, Amethyst. Michael - Faith = 1st Ray. Jophiel - Christine = 2th Ray. Chamuel - Charity = 3th Ray. Gabriel - Hope = 4th Ray. Raphael - Mary = 5th Ray. Uriel - Aurora = 6th Ray. Zadkiel - Amethyst = 7th Ray. When someone say ... The 7 Main Archangels ... They refer to their 'Male' side ... but they have also a Female side. Now ... there are ... 'es' ... Angels ... like Antar-es ... as well of other types. A Great Archangel say recently ... that Angel means Angel ... (of Consciousness) and Helena Blavatsky explained that Atom-Spirit-Angel ... are all related. Let us begin ... In the release of my "FT Lunar Calendar" ... in recent Years ... after many years of Study and Meditation ... I order ... Colors (Vibrations), with Angels and Notes=Tones. The Archangel of Today is Raphael ... the Lord of Today is Maitreya which main color is Silver ... while he has also others like Blue, White and Crystal. A Musical Note ... and there are 7 ... Do, Re, Mi, Fa, Sol, La, Si ... are Sounds ... close to the notes. Johann Sebastian Bach ... produce its Music ... using many Gematria ... or Number-Alphabet codes ... This is the most popular. (J. S. BACH is 41). The Mathematical Architecture of Bach's ‘‘THE ART OF FUGUE’’ by Marco Costa - Il Saggiatore Musicale. The Mathematical Architecture of Bach's Goldberg Variations by Herbert Anton Kellner. Like you see ... Bach name is ... BACH=14 ... His monogram includes his initials ... JSB = 29. Now ... Bach ... split the number 14 in 9+5=14 (You can also have 13+1, 10+4 ... He choose 9+5). Now ... he add 9+5 = 14 = BACH ... but with these numbers he unite them ... one close the other ... 95 ... and then factorize. 95=5x19. He includes name like CREDO= 3+17+5+4+14=43. TRINITY = 19+17+9+13+9+19+23=109. He also use Soli Deo Gloria, SDG=18+4+7=29. JSB=SDG=29. He produce ... Its Goldberg Variations ... (as well any Great Piece of Music) ... using Mathematics ... still ... or Quantum Mathematics ... or something close. In Variation 3 ... Cannon at Unison ... 3 x 64 + 1 = 193. The first numerus perfectus is 6, made up by the sum of its divisors as follows: 6=1+2+3; such games were even even described in Johann Gottfried Walthers Musicalisches Lexikon of 1732 and by his teacher Werckmeister in Musicalische Temperatur, 1691, chapter VI. Bach's 6th variation sets off with the prime triptych 353, the well-tem-pered fifths framed by the Trinity. It ends regularly after 64 bars at 416, at this stage rather arbitrarily decomposed into 41 for J. S. Bach and 6 again, numerus perfectus. But this also factorizes via 13 in a tri-unitarian way: 416 =2^5 x 13. Friends ... this is very vast ... and very sweet ... How and Why JSB choose some factorization ... it is matter of 'my' Future. Giovanni A. Orlando. (161 ... God ... Perfect ... God ... 1428 ... (God Earth)=Bach ... Bach x 2 = 2nd Perfect number).